NOVA ROCK 2019 - Announced Bands For Red Bull Music Stage! 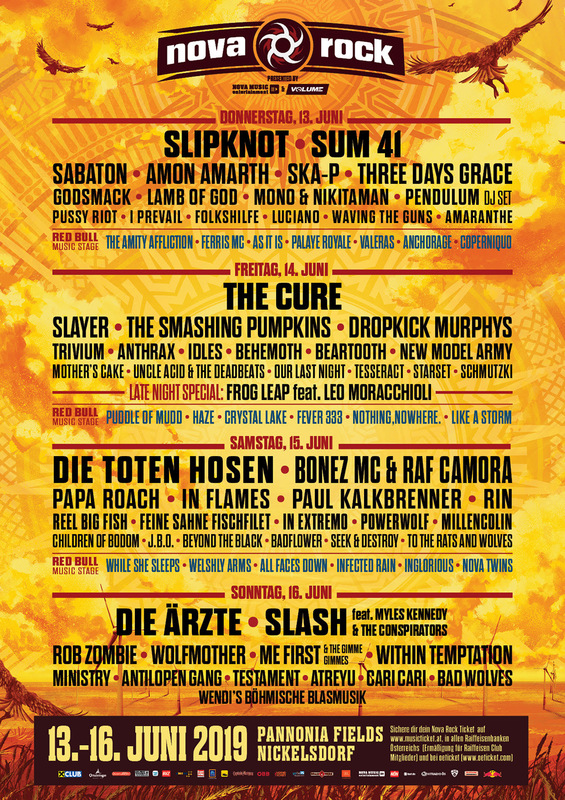 Austria's biggest Rock/Metal Festival, Nova Rock has announced the line up for Red Bull Music stage! "It goes on and on and we are happy every year that not only Blue and Red Stage are officially sounded. An integral part of the NOVA ROCK Festival for many years is the RED BULL MUSIC Stage, which will bring great acts to Nickelsdorf again in 2019. From the days of the festival, there is already a pretty clear picture where the NOVA ROCK path leads this year musically. Once again, of course, the bandwidth and balance that make the NOVA ROCK Festival a great experience for all its visitors will be decisive. THE AMITY AFFLICTION, PUDDLE OF MUDD and WHILE SHE SLEEPS give the fierce headliners, FERRIS MC, HAZE, NOTHING, NOWHERE. and the NOVA TWINS provide Rap / Hip Hop without turning their backs on certain rock influences. WELSHLY ARMS, ALL FACES DOWN, CRYSTAL LAKE, AS IT IS, FEVER 333, INFECTED RAIN, PALAYE ROYALE, VALERAS, INGLORIOUS and LIKE A STORM will astonish visitors in every way. ANCHORAGE and COPERNIQUO from Austria prove with certainty that they will soon be among the local musical stars." NOVA ROCK FESTIVAL 2019 is presented by VOLUME 14.-16.06.2019 / Pannonia Fields / Nickelsdorf, Austria.